West Bromwich Albion have played down the severity of a dressing-room argument between their players after Saturday's 3-3 draw against Cardiff. Tempers flared after Premier League relegation rivals Cardiff scored an injury-time equaliser at the Hawthorns. It has been claimed Baggies striker Saido Berahino suffered a head injury. "Tensions were understandably running high in the dressing room, but the incident has been sensationalised in the media," said a club spokesman. The Premier League match was a crucial encounter between two sides in the bottom five hoping to avoid relegation from the top flight. Albion surrendered an early 2-0 advantage as Cardiff fought back to 2-2, before the home side thought they had secured an injury-time victory. French forward Thievy Bifouma converted fellow substitute Berahino's cross for 3-2, before England Under-21 forward Berahino gave away possession, setting up a Cardiff attack which ended in Mats Moller Daehli scoring a 95th-minute equaliser. Despite the point, Albion slipped to 17th and remain three points clear of Cardiff with a handful of games remaining. It has been reported that Berahino was the target of verbal abuse from his team-mates before becoming involved in a physical confrontation with one player. 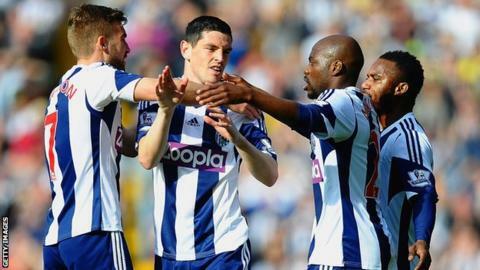 "What happened is not uncommon in a dressing room and shows that the players care," added Albion's spokesman. "The players involved have apologised. The club has drawn a line under the matter and is now fully focusing on Saturday's important game at Norwich."